Heart rates may increase while viewing Brit Bunkley’s video Ghost Shelter, which is also the title of the multi-disciplinary artist’s installation of sculpture and video works that has just opened at the Sarjeant on the Quay, until 26 August. The combination of mechanical background noise and a camera that slowly circles derelict buildings and monuments creates a state of tension. It is however an experience the artist intends to be cathartic. The video is a series of virtual flyovers of 3D scans of structures that have a deserted, end of the world atmosphere about them. The video is shown along with the 3D small-scale models that Bunkley has printed from the same digital files. The artist travelled around Europe and America visiting sites that were “a little bit out there” – the ruined remnants of post-industrial societies, crumbling with neglect and so occupying a place “between culture and nature.” Sometimes Bunkley was unable to mount his camera high enough on the buildings to make a scan, so he used a drone to take multiple photographs which he then converted into the 3D images we see in Ghost Shelter. One of the buildings, Chemiewerk Rüdersdorf, is an abandoned chemical factory in the former East Germany, and another image is of Teufelsberg, a man made hill built on the rubble of World War II, which became a US listening station during the Cold War. “Its history is very layered. A Nazi military technical college that was never completed is buried under the rubble of Berlin then the NSA (National Security Agency) built an echelon [high-tech information-interception system] on top of it. Now it’s a ruin where a lot of tourists go and a bunch of hippy permaculturists live around,” says Bunkley. 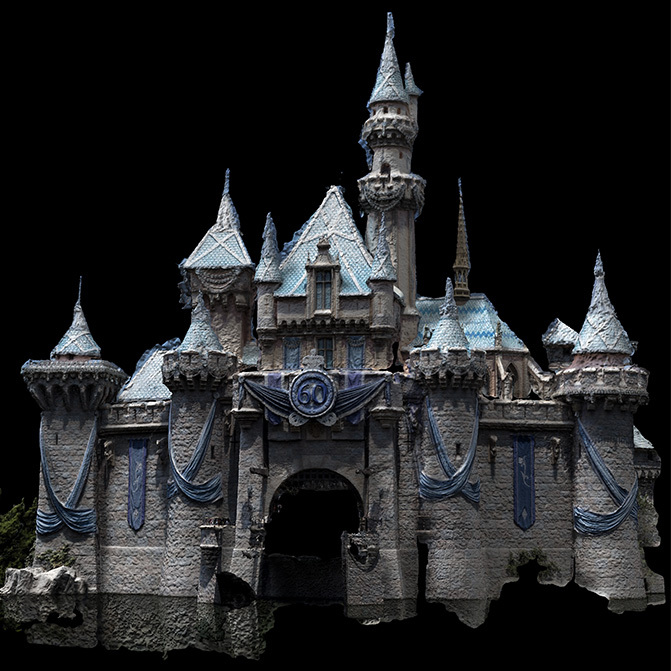 He created another eerie image of the Disney Castle, “the bright face of capitalism” and points out that Walt Disney attended Nazi Party meetings in the 1930’s. The Stalker, is a series of sepia toned images taken mostly in water or underwater and again has the theme of nature taking over. It references the film “Stalker” by Tarkovsky, a Soviet director who made science fiction and surreal movies. An accompanying display of wall fragments, blasted with bullet holes and shrapnel depicts another level of ruin. A pockmarked wall in the side of a chapel in Barcelona marks the place where 42 children died during the Spanish Civil War. Bunkley made full sized scanned models of the wall fragments and painted the pockmarks with gold to symbolise healing. Bunkley’s film Godzone has just been shortlisted for the Move Cine Arch Film Festival 2018 in Paris.